The perceived benefits of the Adani mining operations (particularly job creation) will come at a significant cost to the local community if we fail to act now. This was the key take-home message at a health forum held in Townsville last week. How Will the Adani Carmichael Mine Affect Health? forum came just days after Adani announced that it would start work on its Carmichael coalmine project as early as October, bringing a particular urgency to the need for such an event. 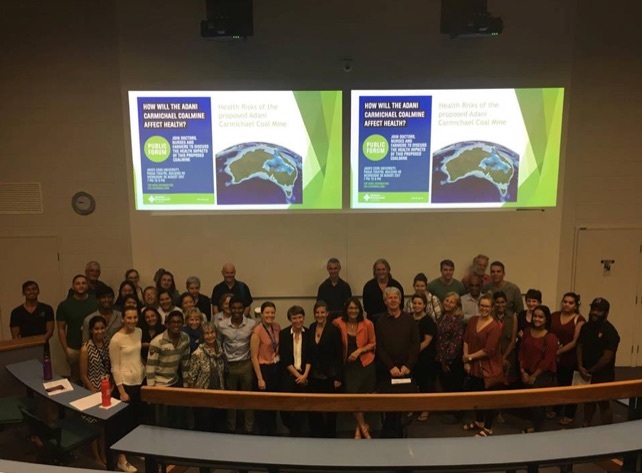 Hosted by medical group Doctors for the Environment Australia at James Cook University, the forum brought together doctors as well as medical students, nurses, farming families, local activists, Greens party supporters and both Labor and LNP voters. The diverse gathering at the forum showed that the people of Townsville are passionate about positive health outcomes in the local community, regardless of their political affiliations. This shows that it is possible to bridge the gap between the so-called “us and them” divide that is often perpetrated by the local media. However, the issue it is not just one for central Queensland but for all Australians as evident by the many hundreds of people across the nation that joined the event on Facebook Live and connected with it on Twitter. 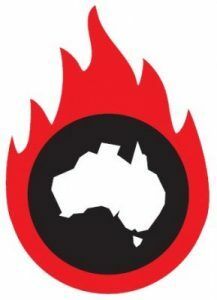 Dr Lucy Owen, a Townsville emergency medicine registrar and passionate environmental activist, discussed the health harms from the proposed Adani coalmine, and the resurgence of pneumoconiosis (Black Lung disease) in Australia, as well as the significant contribution that the Adani mining operations will make to Australia’s carbon emissions if allowed to proceed. This contrasts with our nation’s goals of reducing carbon emissions as per the Paris Agreement. Owen discussed studies showing the progression of tropical disease susceptibility in Australia that will be caused by increasing temperatures. With the closure of the Ubulu Refinery leaving the Townsville population seeking employment opportunities, she highlighted that the proposed Adani mine does not provide secure long-term employment and is not a viable alternative. Rike Wolf, a public health and emergency nurse with a Masters in Public Health and Tropical Medicine and a PGCert in Refugee and Disaster Health (and founder of Food Rescue Townsville), spoke about the significant overestimation of long term job prospects produced by the mine’s construction. Initially Adani claimed the mine would create 10,000 jobs per annum but was later contradicted by the group’s own expert witness, who stated in the Land Court of Australia that the job creation rate would be 1,464 jobs per annum on average. Wolf also touched on the negative impacts of the proposed expansion of Abbott Point ports on the reef and tropical environment tourism industries upon which north Queensland relies. The lack of financial viability of the proposed mines was also discussed; with India’s declining interest in importing thermal coal exacerbating the issue of large quantities of thermal coal crashing the market and reducing its own value and therefore profitability. Bruce Currie, a cattle farmer at Jericho, west of Alpha, in the State’s central inland, who will be directly affected by the planned Adani mining operations, told the audience about his struggles with the land courts and his opposition to the mine. He spoke on the impact of pollution and contamination of the Galilee Basin groundwater resource that many farmers in central Queensland use for crops and livestock, and the financial and legal struggles of defending oneself against mining corporations. Currie also raised the issues of mental health in the rural Queensland communities, and how suicide and domestic violence increase in times of severe financial distress on farmers. Audience members were given the opportunity to raise their own concerns, discussing topics such as the lack of government support for drought-stricken farmers – which forces them to accept offers from mining companies that they would otherwise reject. Forum participants also discussed activism strategies such as contacting local, state, and national political representatives about our concerns as a collective, along with awareness posters to put up in general practice waiting rooms. Many medical students who did not know much about the health implications of the Adani mine found the forum informative, and the evening was effective in spreading awareness about this environmental crisis and motivating activism in the community. 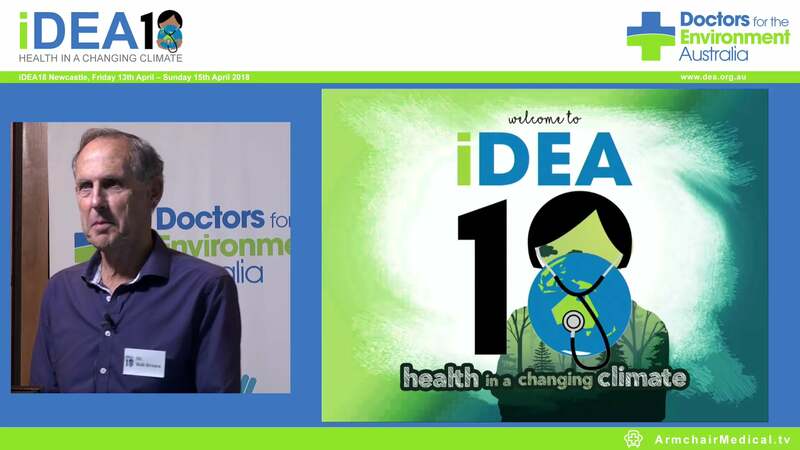 Doctors for the Environment Australia is looking for further ways for the discussion to continue and for action to arise within the health sector, university setting and the general community. With the recent Adani announcement on the Carmichael project beginning sooner rather than later, there is no better time to act than now. Kira Muller is a first year medical student at James Cook University, Queensland, and a member of Doctors for the Environment Australia. Her interests are in protecting the environment and obstetrics/gynaecology (and in her free time, making homemade vegan cupcakes and waffles).